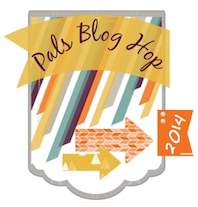 Welcome to the July Pals Blog Hop. This month we are featuring a New Hues Review. Let the new Stampin' Up! In Colors for 2014-16 inspire you - Blackberry Bliss, Lost Lagoon, Mossy Meadow, Hello Honey, and Tangelo Twist. We hope you find great inspiration from our creations. You may just be starting the blog hop or may have come from # 9 Amy Hoptay http://inkingofyou.com/ on the Pals Hop. If you get off track at any time, the full lineup below will help you move along from blog to blog so you see all of the amazing creations. 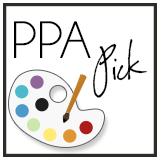 I am really excited how my card was able to incorporate each of the new In Colors – easier said than done. I had come across a technique recently that I wanted to try and the Lost Lagoon fit the bill perfectly! I used a Chocolate Chip ink pad wiped across the front of the Lost Lagoon 5 ¼” x 4” face card, scored it at ¼” across and wiped my Illuminate ink pad across the front of it again for a weathered board look. When I pictured trying this technique, I envisioned a nautical theme not the New In Colors. Another piece of Lost Lagoon was used as part of the double matting beneath the stamped image along with Chocolate Chip cardstock. Hello Honey ink was used for the Off the Grid stamp (retired) and the Blueberry Bliss marker was used to highlight just a partial saying of the “a thousand thanks”. Blackberry Bliss flowers, Mossy Meadow leaves and a Tangello Twist banner complete the homage. I encourage you to try the above technique as it was simple and quick, the picture does not do the finished product justice. The next stop is # 11 Kerry Willard Bray http://www.kerrywillardbray.com/ on the Pals Blog Hop! Thanks for visiting and I hope to see you next month. Posted on July 9, 2014 by Martie Pollard.